San Francisco, one of the most photographed cities in the World! San Francisco is a photographer's paradise with so many possibilities. On this photo safari, led by San Francisco photographer Carol Santos or SF Photo Safari staff, we will explore several well known areas. Upon meeting, Carol or staff will first spend some time going over the fundamentals of photography such as composition, manual settings, lighting and more. Our adventures will take us to very good vantage points to photograph the San Francisco Bay Bridge, The Embarcadero Center, San Francisco Ferry Building, Justin Herman Plaza, Alcatraz Island and Pier 39 at Fisherman’s Wharf. These are iconic images you have seen in postcards and travel books, but now, with Carol's help, they can be in YOUR camera. What is great about this safari is you will learn as you go and it is very user friendly. This safari is designed for all levels of photography and will help you achieve beautiful San Francisco images. Bring with you your camera’s manual, a fully charged battery (and an extra one, just in case), a polarizing filter (if you have one) and an eagerness to explore. We will start our morning safari at 30 minutes prior to sunrise - to get the best light and beat the crowds. The safari will last two and a half to three hours. Once your ticket for the safari has been purchased, you will be given specific instructions on where to meet. Parking is difficult in this part of the city so you may opt to take public transportation, a taxi or have someone drop you off. From within’ the city, MUNI and BART both have stops at the Embarcadero. We will be taking a short street car ride together from the Ferry Building to Pier 39, which is where our safari ends. Fisherman Wharf has many photo opportunities and great restaurants, so you might want to plan some time after the safari to walk around and perhaps have lunch in this famous part of San Francisco. Morning Photo Safaris. All morning photo safari's are booked by appointment individually one-on-one at $50 per hour (3 hour minimum). Or as a group of three people or more, with a 3 people minimum at $99 per person. 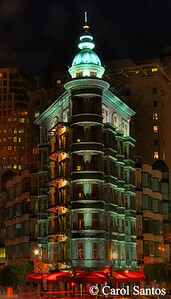 San Francisco is a photographer's paradise with so many possibilities, especially at night! On this night time photo safari led by San Francisco photographer Carol Santos or SF Photo Safari staff, we will explore several well known icons. Upon meeting, Carol or staff will spend some time going over the principals of night photography. Our adventures will take us to very good vantage points to photograph the Golden Gate Bridge, Palace of Fine Arts, the Conservatory of Flowers and the Palace of The Legion of Honor. These are iconic images you have seen in postcards and travel books, but now, with Carol's help, they can be in YOUR camera. As we go from site to site we will learn about composition, long exposures, white balance settings and apertures. How do you take pictures at night without a flash? How can you operate your camera on the Manual setting for nighttime work? This safari is designed for all levels of photography and will help you achieve beautiful night time images. A sturdy tripod is a must and a remote release for your camera is suggested. We will start our safari 30 minutes prior to sunset and will last 2.5 hours up to three hours. Once your ticket for the safari has been purchased, you will be given specific instructions on where to meet. Bring your vehicle as we will drive to three locations. Car pooling is suggested. Gear for Nighttime Photography: Flashlight, Timer, Remote, Camera Manual, Bug Spray, Extra battery, A sturdy Tripod and of course, your camera. What to Wear? Dress warm in layers. Bring a warm coat, scarf and gloves, just in case. You never know how the weather will be in San Francisco at night. Can be very, very chilly and windy at the bridge. Wear comfortable walking shoes. Cost is $99.00 per person per safari (need at least 3 participants) and $50 per hour for private one-on-one instruction (with a three hour minimum). Contact us at sfphotosafari@gmail.com. Night Photo Safaris. All evening photo safari's start a half hour prior to sunset. Rain cancels.